Sandwiches are one of the best food combinations ever conceived. They often contain everything you need: bread, meat, cheese, and veggies. 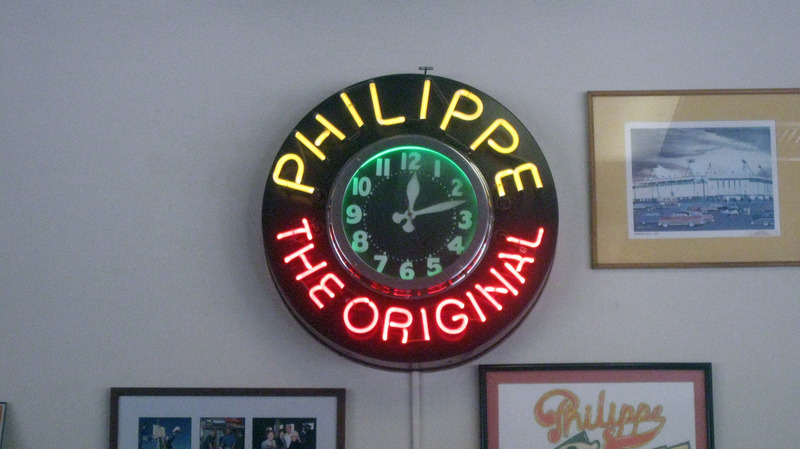 One of the oldest and best sandwich shops in LA is Philippe the Original (called Philippe’s by the locals). 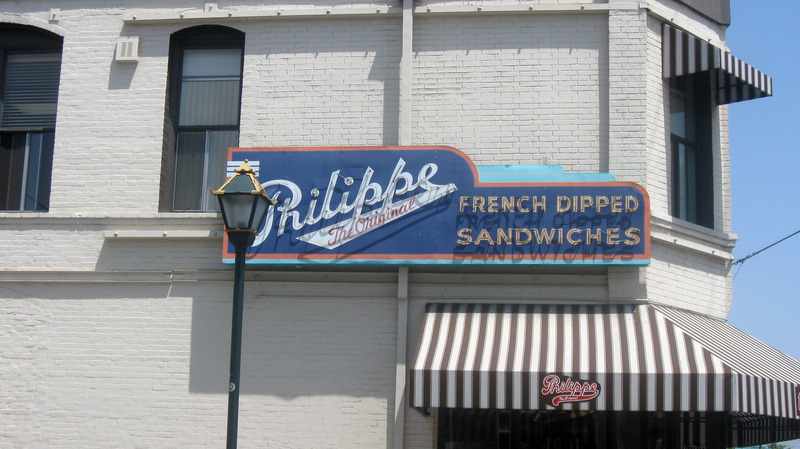 Established in 1908 the shop features French dipped sandwiches in a variety of meats. 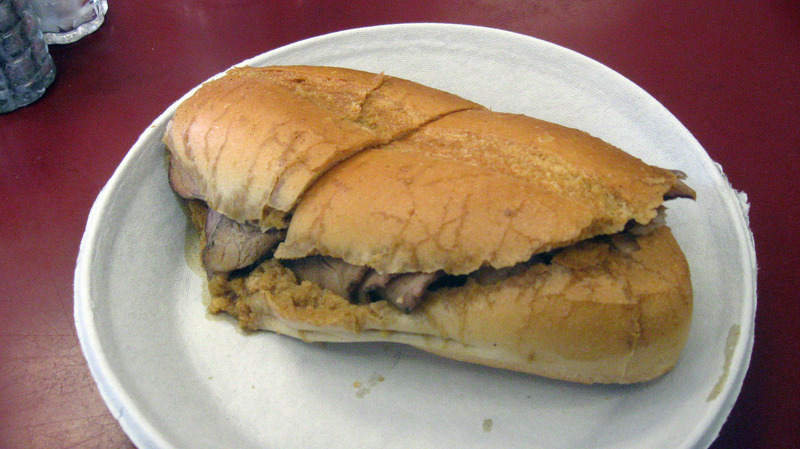 What sets their sandwiches apart is that the meat is pre dipped an au jus variation made from different meat drippings. There is also a good variety of sides that can be chosen to complete the meal. The restaurant has a very historical feel to the layout. One of the unique aspects of the shop is that there is no assigned seating. Most of the tables are long benches and you sit where you want much like a cafeteria. There is also a second floor with more tables for the busy days. The counter looks like a deli counter and service is pretty quick. One of the major parts of the restaurant that stands out is the odd choice of adding sawdust to the floor, but it is likely to absorb any dripping that fall from your plate. In addition to food you can also grab some merchandise at the shop and this is one of those few spots where there is some great people watching to be had. 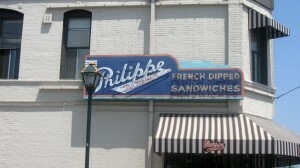 On my most recent trip I chose the original dip sandwich in pork with Swiss. I was told that pork was their best, though I almost went with lamb. 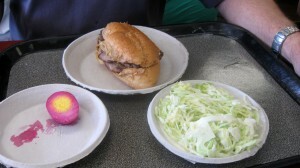 I also got coleslaw and pickled eggs for side dishes. The sandwich was great and not nearly as messy as a regular dip sandwich. The French roll absorbed some of the sauce which went well with the tender pork and melted cheese. The sandwich is big enough to make a full meal and you should eat it when it is warm and fresh. While pickled eggs may not seem all that appealing they are really well done here. They are hard boiled eggs cut in half and pickled to add a different layer of flavor. While you can taste the egg it is the pickling juice that really gives this side dish the flavor. Finally, the coleslaw was also really good, but a bit messy. It is made a little wet, but it has a nice sweet flavor that complements the sandwiches and it is one of the more popular sides. I recommend the original dip sandwich to anyone who likes a good meaty sandwich, I enjoyed the pork, but you should try which ever meat you prefer most. The pickled eggs should only be tried by the curious or those who like eggs. If you are not fond of eggs or pickled foods you should obviously avoid the pickled eggs. The coleslaw is really good, but a bit messier than I was expecting. Thankfully I did not mess up my suit, but if you are dressed in business wear or clothing you would not like to get messy you may want to skip on the coleslaw. Otherwise it is some of the best sweet slaw I have had in awhile. 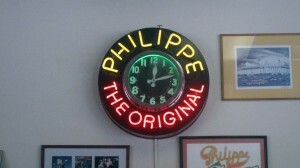 Nestled in downtown LA Philippe’s is an easy place to hit when you are stuck in LA for an event or a fabric run. Right down on the corner where Alameda, Main, and Ord meet it is very hard to miss the big sign. 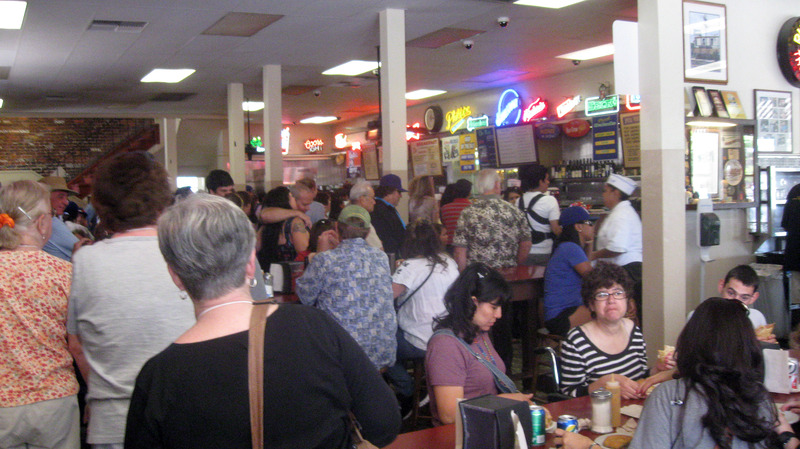 This is one of those little shops that the locals know and often hit for lunch or before a Dodger game so be aware that it can get busy. 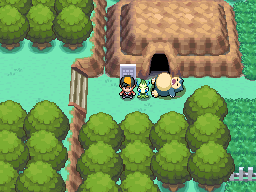 However, for a very reasonable price you can fill your stomach up at an easy to get to location. Also, getting a seat is not too difficult to do if you have a small group. It is also a good idea to have one person order for the group and let the other people find seating for everyone.